After a rousing success last year at its first turn as a Utah Arts Festival venue, The Leonardo museum returns with a new series of workshops at the Art Lab; free, public interactive in which participants can build simple musculoskeletal systems and observe digital painting and sculpting in animation, and five pairs of artists – each with a unique style – collaborating to create new works before the public’s eyes. The art workshops, which require advance registration and nominal fees that include the cost of materials, will take place in the museum’s art lab, which artist Jann Haworth has described previously as the artist’s innovative version of the organizational R&D department. She will be leading two sessions of a workshop titled ‘Drawing For The Terrified,’ (June 26, 27: $20) aimed specifically at people who have never drawn before but who aspire to develop and improve their skills. Another workshop, titled ‘Clay Pinch Pot Creatures: Fins, scales, fur & tails!,’ coincides with the museum’s current exhibition ‘Animal Inside Out, A Body Worlds Production.’ Alyssa Bray will lead two sessions in which participants will fashion creatures out of clay (June 26, 29: $20). She also will lead a workshop in which participants will make handled mugs out of clay using slab and hand building techniques (June 26, 29: $20). The workshops are generally geared to persons 10 and older. 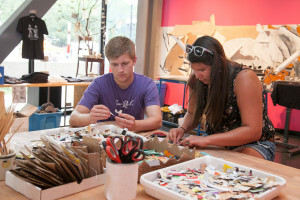 Workshops will be held in The Leonardo’s Lab @Leo throughout the Utah Arts Festival. Photo by Nicole Morgenthau. As for the workshops, interested participants should register early here, as space is limited. Workshops vary in size from six to 12 participants and they require no previous experience. The museum also is offering several events that are free and open to persons of all ages and will be available throughout the festival weekend. 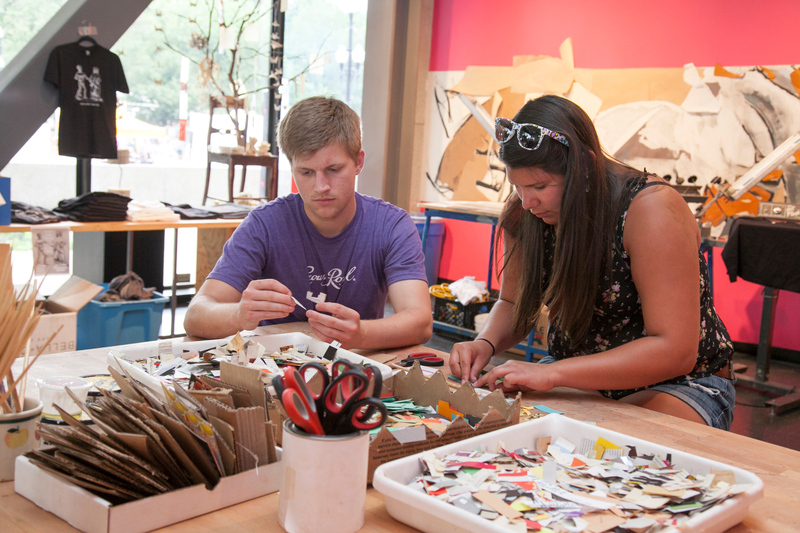 For ‘Grabber Dragons and Cardboard Creatures in the museum’s tinkering garage station, Bruce Kizerian will help visitors build simple musculoskeletal systems from cardboard, strings, rubber bands, tape, brads, and other materials found at home or in The Tinkering Garage. Micah Larsen will lead ‘Animation Creation and Its Future” in the atrium’s digital commons station, where visitors can see and try out the new generation of digital animation techniques. Eight artists participated last year in the inaugural event of CollaborArt. This year, 10 artists are expected to participate in the event at The Leonardo. Photo by Nicole Morgenthau. Back at the Art Lab, ten artists working in five pairs, each coming from different creative backgrounds, will participate throughout the weekend in CollaborART. The pairs will be: Bret Hanson and Josh Luther; Stefanie Dykes and Fidalis Buehler; Brad Slaugh and Sri Whipple; Kent Christensen and Levi Jackson, and Austin Namba and Jan Marie. Visitors will witness the artistic process from start to finish — from sketches on the first day to the finished works. Seven of the artists — Hanson, Luther, Dykes, Slaugh, Whpple, Christensen and Namba — are participating for the second time in CollaborART. This is actually an unfamiliar creative platform for many artists who typically work in solitude and who often envision their studios as inviolable sanctuaries of creativity and aesthetics. As intriguing as the collaborative experience is as a ground for experimentation among artists, it also carries the occasional risk of tension where some artists might become testy, impatient, and defensive even as the interaction invites a vigorous, immediate effect to the creative process. Haworth, whose own award-winning and internationally recognized work always has powerfully reflected the value of unconstrained participation and exploration, always encourages the lesson that the artistic being should never be prescribed nor proscribed. As she has suggested, think of CollaborART as art’s form of the scientific process of empirical investigation and rigorous peer review. Crowds packed the lab on each day of the festival last year, as four pairs of artists worked on projects. 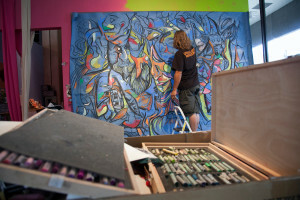 Haworth and Christensen created a 14-foot-high Pop Art work, as spectators watched both artists move up and down ladders to add their distinctive touches in response to each other. A battle scene with fantasy imagery was another work while others included a large-scale pastel art piece and a four-foot high collage that stretched more than 30 feet across the length of the Art Lab. 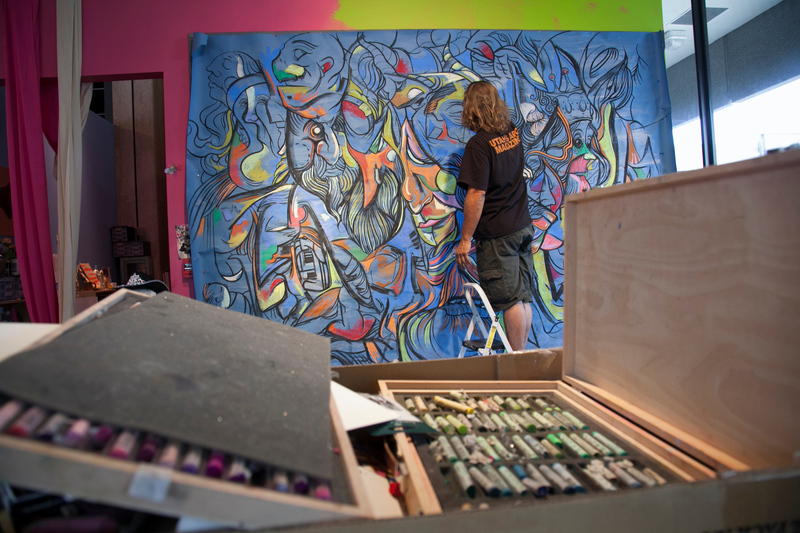 CollaborArt is also supported by Artists of Utah along with donations from the Sam and Diane Stewart Family Foundation and Salt Lake County’s Zoo Arts & Parks (ZAP) program. The Salt Bistro Patio at the Leo Café also is one of the festival’s eight musical performing venues. Among the performers will be musicians representing folk and bluegrass genres from the Intermountain Acoustic Music Association, which will be the festival’s daylong feature on June 28. Other acts during the festival will include music from pop, rock, jazz, Celtic, and world traditions. 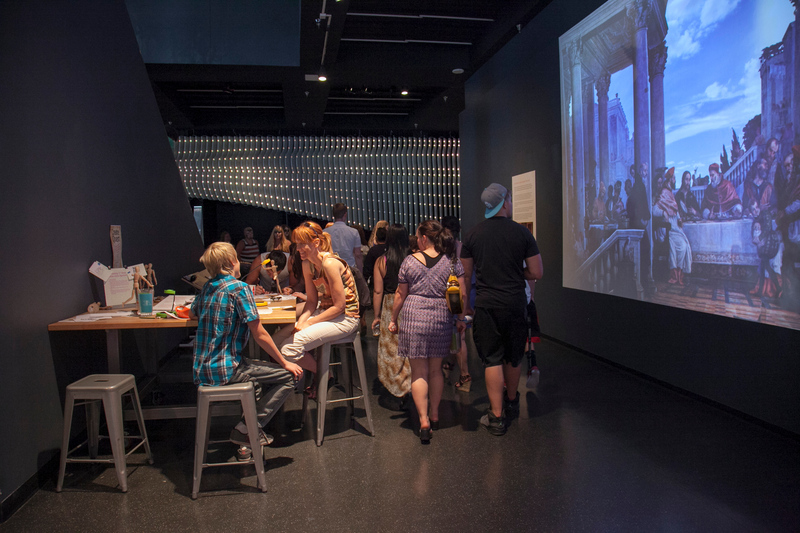 Utah Arts Festival visitors also are invited to view the current ‘Animal Inside Out’ exhibit at The Leonardo, at discounted admission. The exhibition is a Body Worlds Production event. The patio also will feature nightly wine or beer tastings. James Santangelo of the Wine Academy of Utah will offer four wines paired with small plates prepared by the museum chef Zanetta Jones. Epic Brewing Company also will lead a separate beer and food pairing session. The cost is $35 and limited to guests 21 and older. 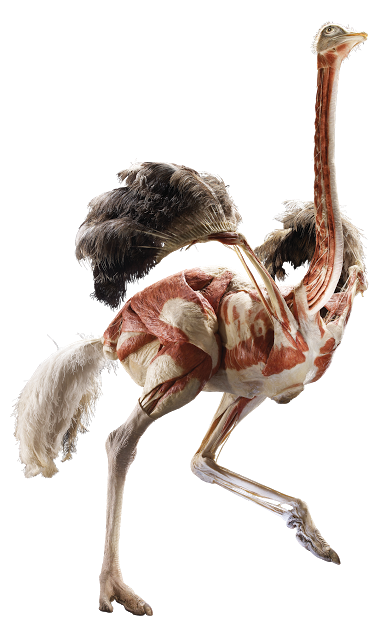 While many of the Leonardo activities have been included in the festival’s regular admission package, festival visitors can pick up a $12 discount voucher at the festival’s box office that will be applied toward the cost of the ‘Animal Inside Out, A Body Worlds Production’ exhibition admission price.